Hate soggy cereal? Who doesn’t? 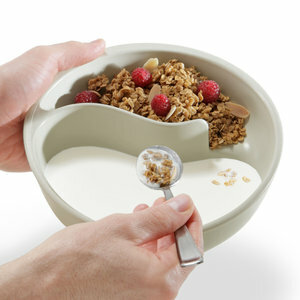 Obol, the Never-Soggy Cereal Bowl solves the problem by having 2 sections in its bowl – one upper section for cereal, and one lower for milk. So it keeps them separate until you want to actually eat. Just scoop a spoonful of your cereal into the milk when you want a bite. Great for cookies and milk, and chips and salsa as well.